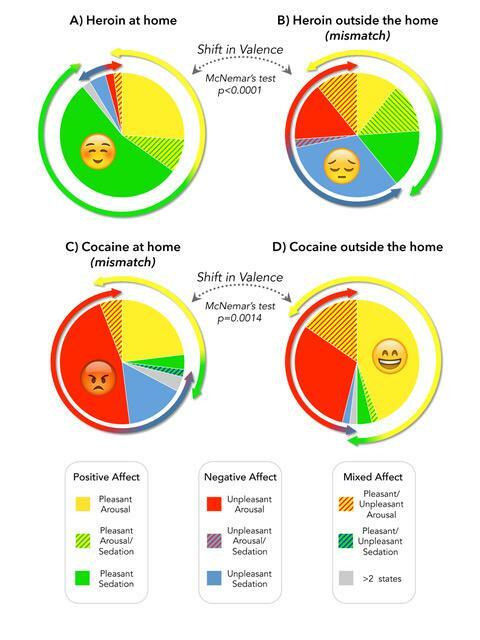 Neuroscientists at the University of Sussex have shown by using brain scans of drug users that heroin stimulates a more pleasurable response when taken at home but cocaine is more pleasurable outside the home, such as in a club. The findings demonstrate for the first time that the setting of drug-taking is an important factor in how the brain processes the experience, and could have important implications for the treatment of drug addiction. The study is published today, Monday 14 May, in the Journal of Neuroscience, the official journal of the Society for Neuroscience. Dr Silvana De Pirro and Professor Aldo Badiani at the Sussex Addiction Research and Intervention Centre (SARIC) at the University of Sussex, in collaboration with colleagues at Sapienza University of Rome, Italy, recruited people with addiction to both cocaine and heroin who receive treatment at a medical centre in Rome. The researchers tested the 'mismatch hypothesis': that taking heroin – which induces a sedative state – while in a stimulating context like a club, and taking cocaine – which is a stimulant – in a private context, creates an emotional state that is at odds with the environment. This mismatch prevents the drug feeling pleasurable. The neuroscientists asked the first group of 53 people to recall a typical drug episode and indicate how arousing and pleasant their experience was with each drug (heroin or cocaine) in two different settings (at home or outside the home). With guidance, the second group of 20 people imagined using the drugs in each setting while their brain activity was measured with functional magnetic resonance imaging. The brain scans showed that during drug imagery that the same setting produced opposite neural responses for each of the two drugs in the brain regions involved in processing reward and context: the prefrontal cortex, caudate and cerebellum. The researchers conclude that the emotional and neural response to addictive drugs changes as a function of both the substance and of the setting of use. The neuroscientists are calling on governments and therapy providers to take into account the impact of different environmental factors on different classes of addictive drugs. They hope this will lead to more effective treatment and fewer people suffering relapses. Dr De Pirro, who undertook this study for her PhD at the University of Sussex, said: "The findings related to the cerebellum are particularly interesting because that part of the brain helps us understand the context of our emotional experiences, so it may explain why the effects of drug taking vary by setting. "This also has important implications for the therapeutic treatment of drug abusers. Considering the interaction between drug type and location could help to prevent relapse. Governments should adapt policies to ensure that therapies take into account the impact of the environmental factors on the risk of relapsing, and on its role in supporting recovery from addiction." Professor Badiani, Director of SARIC at the University of Sussex, says: "These findings challenge the classic view that all drugs produce identical changes in the reward regions of the brain and that they are addictive because of their ability to induce an extremely pleasurable state. "This study shows that the provision of methadone alone is not sufficient for treating heroin addiction. Treatments should also tackle important social and environmental factors. For example, evidence-based intervention such as cognitive behavioural therapy and 'ecological momentary interventions' (such as smart phone applications that people can access anywhere at any time in their real life when they feel an urge to abuse drugs) should be a critical part of the treatment process."